From the Hancock County Courthouse, go south on Hwy 15 for 2.2 miles to where Shoal Rd turns off to the left. Follow Shoal Rd for 3.5 miles to Bethel Church Rd. Turn left on Bethel Church Rd. Go on Bethel Church Rd for 0.7 mile until you come to the church on the right. The cemetery is behind the church. Church founded in 1802, but the original church was about 3-1/2 miles from Sparta on Shoals Road. The church was moved to this site in 1828. 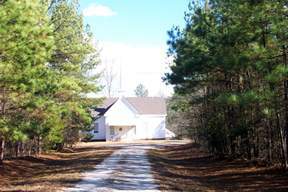 The land for the new site was deeded by John S. Latimer, and the deed names the following trustees of the church: Jesse Lockhart, David Hitchcock, William Barksdale and Byrd W. Brazill. The land was deeded "as a place of Divine worship and burying ground." (Hancock County Deeds, p. 515, Sparta, Ga.). Early records show that this church was about 1/3 African American. It is believed some black members were buried at the back of this cemetery prior to 1868, when black members left this church and organized Hickory Grove Church. 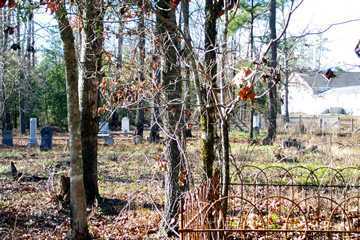 See Original Bethel Church Cemetery for more information. This grave is within a fenced area containing graves 1-8. "Asleep in Jesus / Blessed are the pure in heart, for they shall see God." "In after time we'll meet her." Graves 9 through 12 were formerly surrounded by a fence with granite posts. w/o Ivan Johnson. "Asleep in Jesus, blessed sleep, From which none ever wake to weep." One definite grave. Possibly 2 graves. Brick surrounds the grave. There is room for additional possible graves. Both 1853 and 1908 are hard to read. 1908 may also be 1893 or 1896. 5 slabs in a cluster. Broken headstone. Name is missing. The last name of Dunn is assumed based on the Kimbrough listing since only initials "W. T. D." appear on the grave. On same stone as Martha A. Kelley Dickson. d/o J. C. & M. A. E. Dickson. "She was too good and too gentle to dwell in this cold world." "Sweet be thy rest till he bids thee arise." 10-15 possible graves, with 5 definite graves. "In love she lived, in peace she died; Her life was craved, But God denied." d/o Mr. & Mrs. W. C. Miller. "Budded on earth to bloom in heaven." Graves 52 through 55 are within a fence. "Happy infant early blessed, Rest in peaceful slumber, rest." "A little time on earth he spent 'Til God for him His angels sent." Several depressions outside the fenced area. Possibly 12 or so graves. 2 graves marked by fieldstones within a wrought iron fence. Unmarked Adult Grave - Benjamin Thompson, Jr.
Burke Co., N.C. A Baptist minister. All info and the fact that he is buried here per family tradition handed down from Nancy Holliday Warthen to Lee Dickens. Possibly buried in this cemetery, per Alex Long, Jr.